Two of the most basic fundamentals of a great golf swing are rhythm and balance. In fact, if these two elements of the swing are implemented correctly, it is still possible to strike the ball successfully even with an unorthodox golf swing. This very point can be recognized in the swings of LPGA Hall of Fame member Nancy Lopez and PGA Professional Jim Furyk. Both of these players have positions in their golf swings, which for the average player make it very difficult to strike the golf ball with any type of consistency. 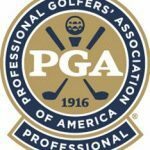 However, because of tremendous rhythm and balance, they are able to return the club to a perfect position at impact and hit precision shots consistently. Rhythm can be defined as a flow, movement or a procedure. It is the regularity in tempo. Tempo is the rate of speed at which a person performs their swing. In other words, a person who possesses good rhythm in their golf swing is one who repeats movements consistently in the same sequences during their swing. 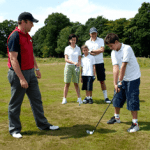 There are different ideas about the correct sequence of events in a golf swing and sometimes as teachers we combine a couple of these parts into one motion in an effort to make the swing seem less complicated. We can break the movements of the backswing down into a sequence of five – the clubhead moves away first followed by the hands, the shoulders, the hips and finally the feet. The downswing sequence of movement is exactly the opposite. The first movement is initiated by the feet followed by the hips, the shoulders, the hands and finally the clubhead. To have good rhythm in your golf swing this sequence should be repeated for every swing. Problems creep into our swing when for example we start the downswing with our shoulders and hands first. This causes an outside-to-inside swing (over the top move) which in turn causes the ball to start to the left. Another common flaw is when the first movement of the downswing is initiated by the hands and clubhead (casting) which diminishes potential distance. Balance is when there is bodily equilibrium or stability. Balance in a golf swing must start at address. A golfer is in perfect balance at address when his/her weight is equally distributed between both feet right through the middle of their feet. If a person finds that they are leaning more toward their toes at address then the tendency is for the downswing to be an outside-to-inside swing usually referred to as “coming over the top”. This causes the ball to start out to the left of the target and for the majority of golfers this is usually accompanied with a slice. Conversely, if the golfer were out of balance with the weight too much toward their heels the tendency would be for the swing to come too much from the inside to outside that would create a push – a ball starting out to the right. A golfer should remain in balance throughout his/her swing. The position in the golf swing that is most telling if a player is in balance or out of balance is the finish. To be in a good balanced position at the conclusion of the golf swing the player should be able to hold their position for a count of three or as I like to tell my students, “long enough for someone to focus their camera and take a picture of you.” If you can not hold your finished position at the conclusion of each swing consistently, then you most likely will find yourself hitting errant shots throughout your round. Remember, not all of us have technically perfect swings that are pleasing to the eye, but if we can make a concentrated effort to implement rhythm and balance in our swings then we will find much more success in hitting the ball. Golf will become more fun and our scores should improve. Good luck with the rest of your golf season.